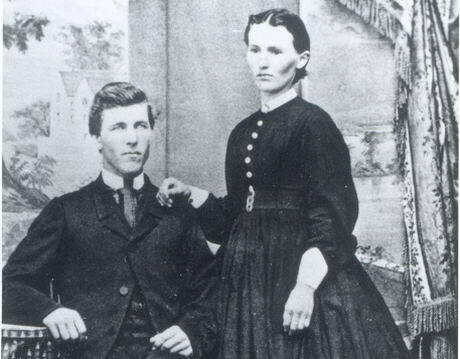 Peter Howard SEAMAN and his wife, Urania Adeline McLEAN became homesteaders in Nebraska. Along with many of their friends and neighbors from Grey and Bruce counties in Ontario, they chose to become pioneers in the 1870's. More information is here. This website details the genealogy and lives of the descendants of Caleb Seaman (1740-1820). Caleb Seaman was a great grandson of Capt. John Seaman and was born on Long Island in the colony of New York. A Loyalist, Caleb supported the crown during the Revolutionary war. After the war and his release from prison, he and his family left New York state and moved to Canada. In 1789 they settled in Ontario along the St. Lawrence River near Brockville. In recognition of his loyalty to the Crown, he was granted 200 acres of land. Several of his children were also granted their 200 acres. Caleb setup shop as a blacksmith in the village of Lyn and raised his children. Of those 11 children, as adults, most stayed in Canada while some chose to make their homes across the river back in the young United States. The descendants of Caleb now number into the thousands and are spread out from coast to coast, both in Canada, the United States and beyond. The stories of many of them are within this website. Many materials on this site are restricted to family members. If you are a descendant of Caleb Seaman, you may wish to request an account here. A brief guided tour of some of this site's points-of-interest. Take a look. A tree showing 4 generations of Caleb Seaman's descendents. See if you can find your grandparents or perhaps, great-grandparents listed. Take a look. Words of wisdom (and otherwise) from your webmaster. Actually more of a place to tell about what happens around here to make this website grow.